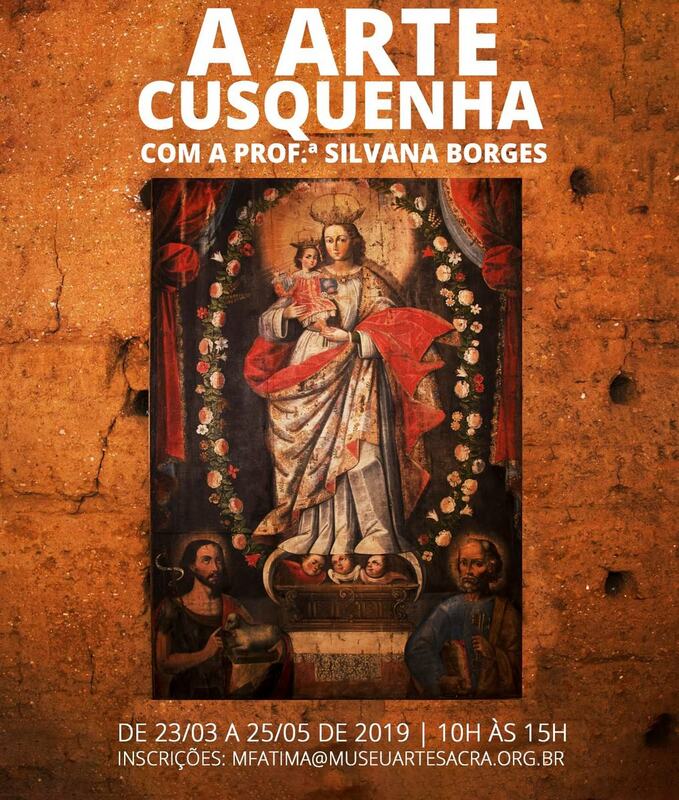 A Museum of sacred art promotes a practical course on Expressions In Sacred Art: A Cusquenha Art with Prof. Silvana Borges. The artistic tradition called Cuzco School developed in the colonial period between the sixteenth and eighteenth centuries; It is considered the first training center that systematically taught European artistic techniques in the Americas with the introduction of religious art whose main objective was to catechize. The term "cusquenho" (originating from Cuzco, the Empire Inca capital) refers to the colonial paintings Hispanic-Latin American produced in the Andean countries. Although cusquenhos painters were familiar with Byzantine Renaissance art prints, Flemish and Italian, his works followed freer guidelines, the established in the canons followed by their European mentors, with the inclusion of iconographic elements of native flora and fauna as a characteristic background in his works. Silvana Borges It is artist and architect expert in conservation and restoration in the fields of Sacred Art (paint and imaginary) and Architecture (wall art), professional affiliated with the International Concil of Museums (ICOM), the Brazilian Association of Conservatives and Restorers of Cultural Property (ABRACOR) and the Brazilian Imaginary Studies Center (CEIB). Lectures and courses on the preservation of heritage and artistic techniques. His works are published in prestigious art catalogs and literary collections, receiving several awards and trophies, present in exhibitions and collections in countries like Mexico, Italy, USA, France, Spain, Holland, Hungary, Portugal and China on a path 30 years of artistic and literary activities. FREE GYM (2 hours): presentation of the theoretical content with the theme of Cuzco Painting introducing the issues to be covered in the Practical Course. – HISTORY AND SYMBOLS. Brief historical introduction of Spanish rule in America Pre-Columbian. The emergence of Cuzco painting as a kind of religious art, didactic and catechetical; following the guidelines imposed by the Spanish Crown to convert the heathen souls of the colony to the Catholic religion and the influences of some of the religious symbols of the Andean civilizations. – ICONOGRAPHY AND syncretism. Art distancing produced by Indians and mestizos of European canons, the differences in reading the images produced in position and no more static perspective with inserts of indigenous customs and symbols. The profuse representation of the archangels and the characteristic iconography of the Angels arcabuceros. – COLLECTIONS AND STYLES. Among the works cusquenhas studied the sixteenth to the nineteenth, presentation of some of the leading artists of the Cuzco School and their styles: Master Calarmaca, Basilio Santa Cruz Pumacallao, Antonio Sinchi Roca Inka, Diego Quispe Tito and Marcos Zapata. – MATERIALS AND TECHNIQUES. Brief introduction to the practical course of Cuzco painting showing the sources and application of art materials used in the production of Cuzco painting, and techniques: stencil, molds, brocateado. A Arte Cusquenha not MAS. Photo: Disclosure. Practical classes in eight games for the construction of pictorial work, with the final production of a painting following the guidelines of the Cuzco school. The preparation will be performed step-by-step from Cusco a painting from the assembly and use of frame with the manufacture of support in particular flax; preparation and formulation of sealants bases (imprimatur), guidance in selecting and transferring the drawing for each theme chosen by the student and in the preparation of paints with oils and artistic pigments, medius and use of appropriate binders and finishes application of: gilding and brocateado. MATERIAL: all materials for cusquenho execution is included: screen in linen and rack, iconographic variety of molds, oil paints, art pigments; resins, mediums and oils for paint driers; tails, gums and base mineral materials imprimatura; varnishes for finishing. The teacher will guide the 1st. class the acquisition only for individual use brushes. All course material is included in the investment. Address: Avenida Tiradentes, 676 – Subway Tiradentes. Free on-site parking: Rua Jorge Miranda, 43. The Museum will provide certificate of participation.